I am making a mix of herbs to bring me prosperity and I want to add some Wealthy Way to it, because I really like Wealthy Way and I thought it might give the herbs a boost. Should I add Wealthy Way sachet powder or is the Wealthy Way bath salt a better choice? I know salt also holds blessings and energy. It might look prettier? What do you think? I will probably buy both, anyway. Are you wanting to use this mix of herbs in a mojo bag, in a bath, as dressing for candles, or some other purpose? It seems like the answer to your question will depend on your intended use. If you intend to dust papers, mix with dirt and sprinkle on a sidewalk, or mix the herbs iwith the powders and late sift out the herbs and dust your feet or your body with the powders, then sachet would be best. On the other hand, to prepare scrub water for house cleaning or freshening up a place of business, or to brew a tea-bath to bathe in or to add to laundry water, the bath crystas would be best. It's all about form and function! Thank you. I was planning on putting the herbs in a pretty jar and just setting it in my living room. 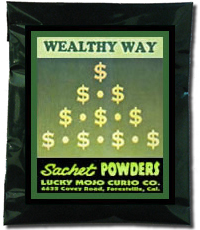 I was wondering with the wealthy way sachet powder, could I mix it with bank dirt, and sprinkle it in my yard, on my sidewalk or put into my potted plants indoors? Thanks in advanced. Yes, you can certainly do all of these suggestions! Those are excellent ways of working with Wealthy Way Sachet Powder. You obviously have a talent for this sort of thing! Can someone please share their experiences with Wealthy Way versus Money Drawing powder? I have both, and I'm still learning the differences in my work. I read that Wealthy Way is more about having extra folding money, as it were, but I'd love to hear from people about their successes using it, and what that meant practically for them. Just in case you don't get any new responses to your question, it would probably be a good idea to scroll back through this thread and read the experiences of people who have used it! I have read the thread, but that's always a good reminder. I guess I was more wondering about the differences between experiences with Wealthy Way vs. Money Drawing specifically. wealthy way to me is to draw wealth and a lifestyle of wealth, it can be used with or in place of money drawing. But money drawing is used in work and games of chance. Wealthy way can be used to draw wealth with may not be an actual physical dollar but an investment, a property investment, stocks, bonds etc. They are from the same family of oils. The best thing to do is order them and try them out and let us know how you loved working with them. I personally see money drawing and wealthy way as a great blend together. The non-monitary wealth thing totally makes sense! I do have both, and just started using the Wealthy Way today, so excited to see how it works for me! Thanks for sharing, JayDee . Thinking about it more, another way it can be used is with Jezebel oil to attract wealthy men to spend their money or that lifestyle ( think Julia Roberts and Pretty Women lol), it can be mixed with a love oil to attract the likes of a weal of wealthy luxurious man. Haha! Love it . See, that suggestion helps me understand the different "vibe" between Wealthy Way and the other Money formulas. Like you said... it's the lifestyle!